Hampshire coach Dale Benkenstein says Michael Carberry's early-season form is partly down to regular visits from England batting coach Graham Gooch. 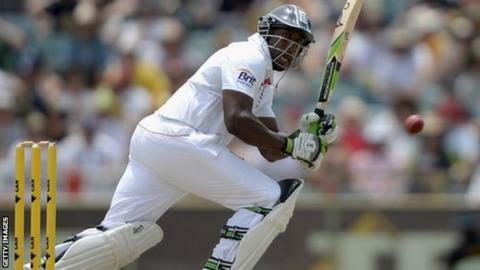 The 33-year-old criticised the England management for poor communication after their 5-0 Ashes series defeat. "There has been discussions with Michael, they've been really good in that way," Benkenstein told BBC Solent. "Since Goochy has been around Michael has been very positive and great in the dressing room with us." Benkenstein added: "He has been down nearly every week, it's not just working on his technique, but the fact they have made the effort to work with him has made a difference. "Carbs is coming out of his shell and he is really starting to play to his own natural ability which is exciting." The opening batsman played all five Ashes Tests in Australia ended the series as England's third-highest run scorer, with an average of just over 28, but was left out of the subsequent one-day series and World Twenty20. In an interview with the Guardian last month, he criticised the England management for not telling him why he did not play in either the one-day series or World Twenty20 that followed. And Benkenstein says the ECB are now in regular discussions with Carberry and that in turn has helped his form and his mood. "They've kept him in the loop, it might not always be what he wants to hear but I think there is communication," he said. "He is in a great place. The disappointment was initially because of the ECB but the place he is now is also down to them communicating with him. It's been a bit of a duel role from them." Carberry is averaging over 40 so far in early season including an early-season hundred and Benkenstein says Gooch has been a huge help.